This study is the product of a multi-year, interdisciplinary effort financed through cooperative agreement between the Minerals Management Service (MMS) of the U.S. Department of the Interior and the Center for Energy Studies at Louisiana State University. The research and oral histories were conducted primarily by a team at the Bureau of Applied Research in Anthropology at the University of Arizona and a team affiliated with the Center for Public History at the University of Houston, which I led. 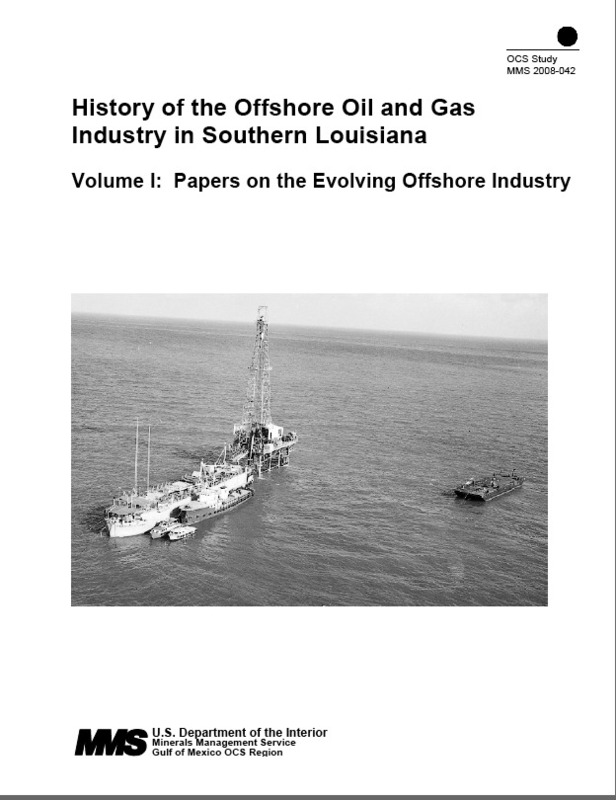 The study combined oral history, documentary research, informal interviews, and historical economic analysis to establish a basis for understanding the history and evolution of the offshore oil and gas industry in southern Louisiana, the birthplace of offshore oil. The study was designed to gather information from the industry’s pioneering engineers, geoscientists, managers, and entrepreneurs who created the organizations and technology required to produce oil and gas sometimes hundreds of miles from land in thousands of feet of water. In addition, oral histories were collected from workers, family members of workers, community leaders, and others whose lives were shaped by the offshore industry. Finally, the researchers sought perspectives of governmental and political leaders who developed the strategies and laws that were used by MMS to regulate and manage the development of offshore resources. More than 450 oral history interviews were recorded and transcribed during this study. The primary repository of the tapes and discs onto which the interviews were recorded and the transcripts of the interviews is the University of Houston Libraries, Special Collections. Additionally, more than 1,000 photos were obtained from individuals, scanned, and included with the oral histories. The collection can be found at Oral Histories – Houston History Project, 1996-2008, Series 7: Energy Development. Oral history audio and transcripts from another MMS/Bureau of Ocean Energy Management study, “Gulf Coast Communities and the Shipbuilding and Offshore Fabrication Industry” (2014) are included in the same collection. Currently, there are 710 oral histories in the collection, some of which are available online. Approximately another 180 will be added once a third Bureau of Ocean Energy Management study, “History of the Gulf of Mexico Offshore Oil and Gas Industry during the Deepwater Era,” (for which I am the principal investigator) is completed in 2015. Copies of audio and transcripts are also available in the archives of Louisiana State University, University of Louisiana at Lafayette, and Nicholls State University, and at the Morgan City Archives, Morgan City, Louisiana, and the South Lafourche Library, CutOff, Louisiana.